WTI and Brent aren’t the only oil pricing benchmarks. For example, the Organization of the Petroleum Exporting Countries (OPEC) has its own pricing benchmark, derived from a weighted average of the prices of petroleum blends produced by OPEC member countries. (For more on OPEC, see the November 2014 issue of PatchWorks.) Other countries, including Mexico, Nigeria, Russia and Singapore, also have their own crude oil pricing benchmarks. If you watch the daily news broadcast, at some point you will see the price of oil per barrel. Crude oil is a commodity traded in the global market, so the price fluctuates based on the market conditions at the time. Because Canada sells a lot of oil, the price of oil is usually a good indicator of Canada’s economic health, which explains why the price is always in the news. Crude oil comes in many different forms and quality levels that are valued differently. To make sure we’re comparing apples to apples, the price you see on the news is based on a standard oil pricing benchmark. If you are in Canada or the United States, that benchmark price is known as the West Texas Intermediate or WTI price. WTI is a light, sweet crude oil. That means it is low density (as compared to the heavy, dense oil from Canada’s oil sands areas) and low in sulphur, which makes it a high-quality oil that needs minimal refining. The WTI price is settled in Cushing, Oklahoma, a major trading hub for US oil. The WTI-Brant price differential depends on marketing factors, including production and transportation infrastructure. On the other hand, if you happen to be watching the news in Europe, the oil price you will see is known as the Brent price. Brent oil, coming from more than a dozen oil fields in the North Sea, is also light and sweet, but not as light or sweet at WTI oil. 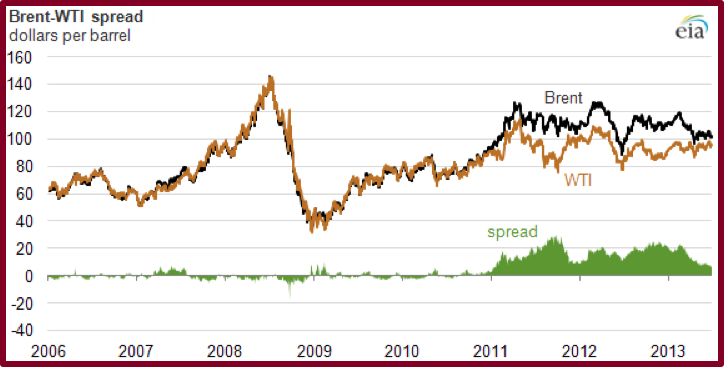 For many years, the WTI and Brent oil prices were very closely aligned, typically spread only a few dollars apart. Then in 2011 and 2012, the price differential widened, primarily because the US increased oil production, causing an oil inventory buildup at Cushing. As a result, the WTI price dropped relative to the Brent price. But with new US oil transportation infrastructure that came online in 2013 (smoothing out the Cushing supply-demand imbalance) and increased production from the Middle East (which affects the Brent price), the WTI-Brent price spread is narrowing again.